Many times when I hear the words, “whole wheat” I immediately think healthy. Rarely does my brain go to “moist and delicious”. And I definitely don’t string all those words together. 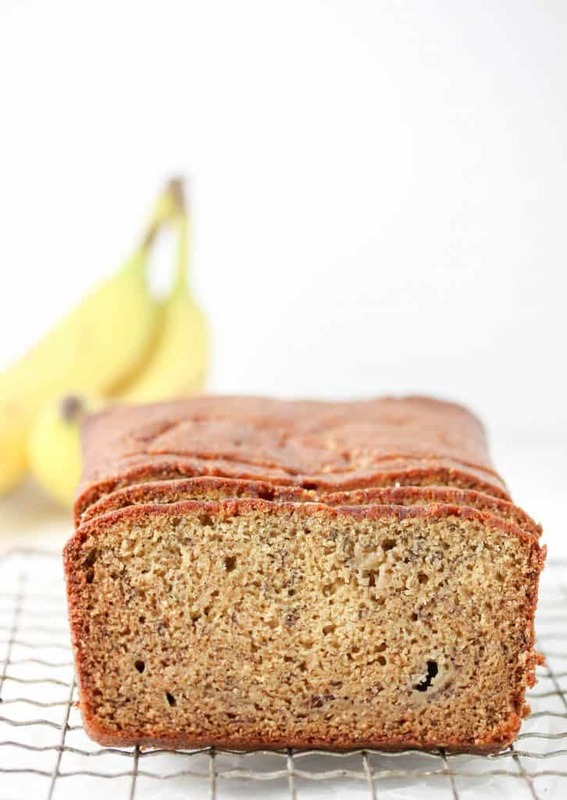 Enter this 100% whole wheat banana bread. Yes, friend it’s 100% whole wheat so that means it’s healthier, AND moist, and delicious. I used the recipe for Flour Bakery’s Famous Banana Bread recipe, which is my go to banana bread recipe and turned it into a whole wheat version. What’s my secret? White Whole Wheat Flour is the key. 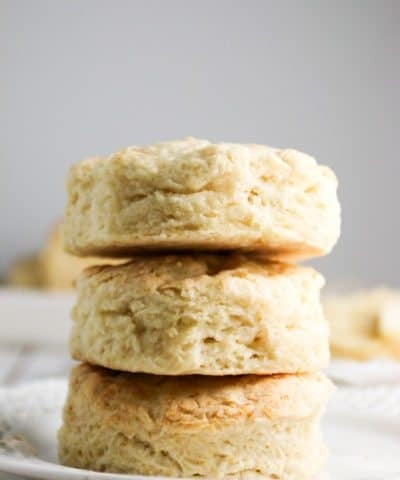 So I admit when I first heard of white whole wheat flour I thought maybe it was manufactured from whole wheat flour like and it was all just too good to be true. Turns out white whole wheat flour is milled from a hard white winter berry. Traditionally, all purpose flour and wheat flour comes from a hard red winter wheat berry. And just like traditional wheat flour, white whole wheat flour uses the whole winter berry making it 100% whole wheat. The difference is that the bran of the white winter berry is lighter in colored, sweeter in taste than traditional wheat flour. So to me that means you get the best of both worlds. 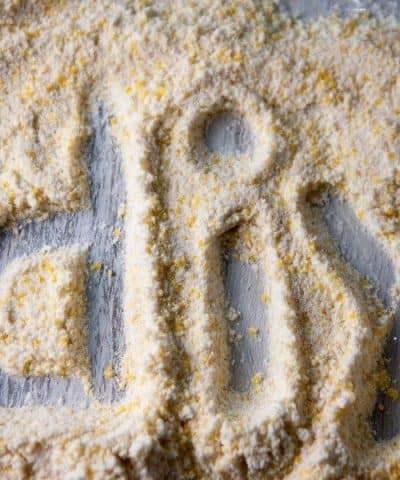 Better texture comparable to using all purpose flour but all of the nutrients like using traditional wheat flour. 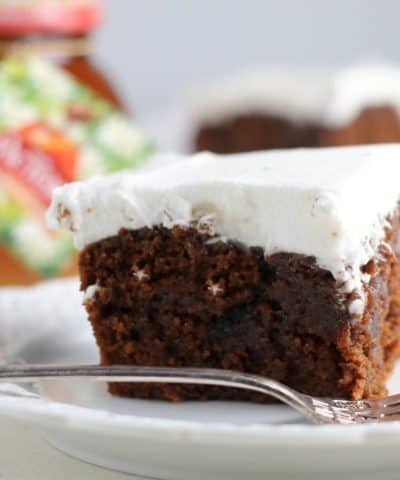 You can substitute white whole wheat flour for your all purpose flour in any of your recipes. One tip given from The Kitchn, is for brownies it’s best to let them rest overnight before serving giving a chance for the bran to soften. 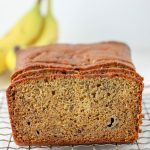 How Do You Make Whole Wheat Banana Bread? 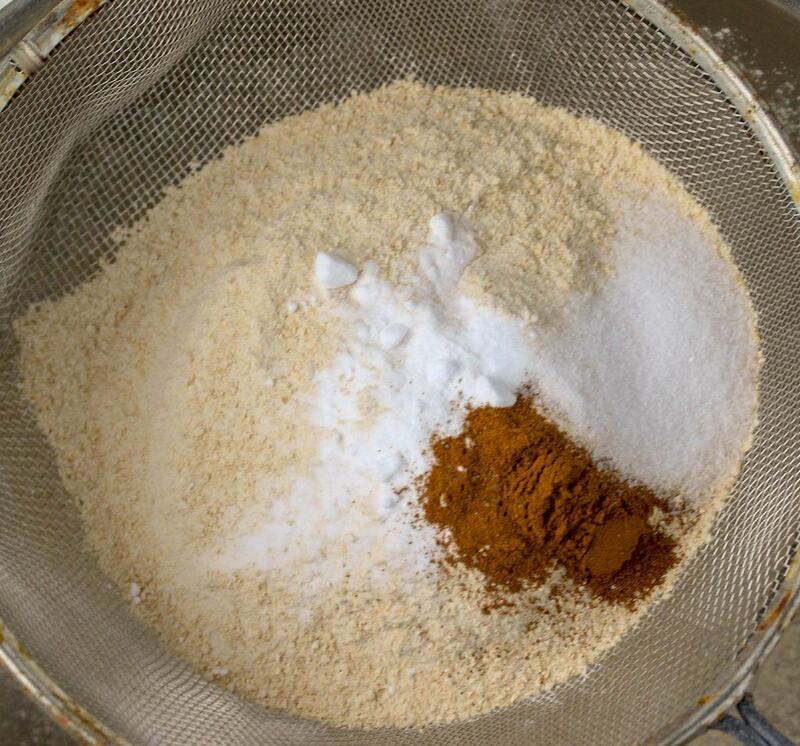 Set your sifter over a mixing bowl and then measure and add the flour, baking soda, cinnamon, and salt. And set aside. 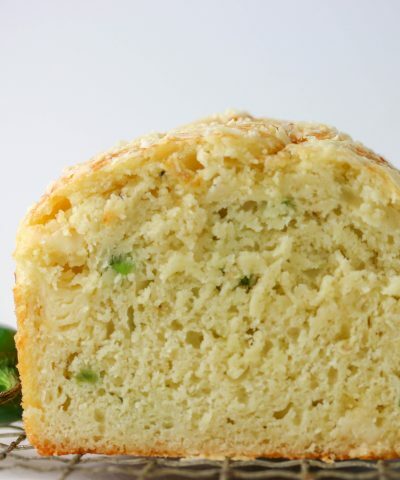 Sifting is necessary to remove any lumps and aerate the mixture to help create a light fluffy bread. 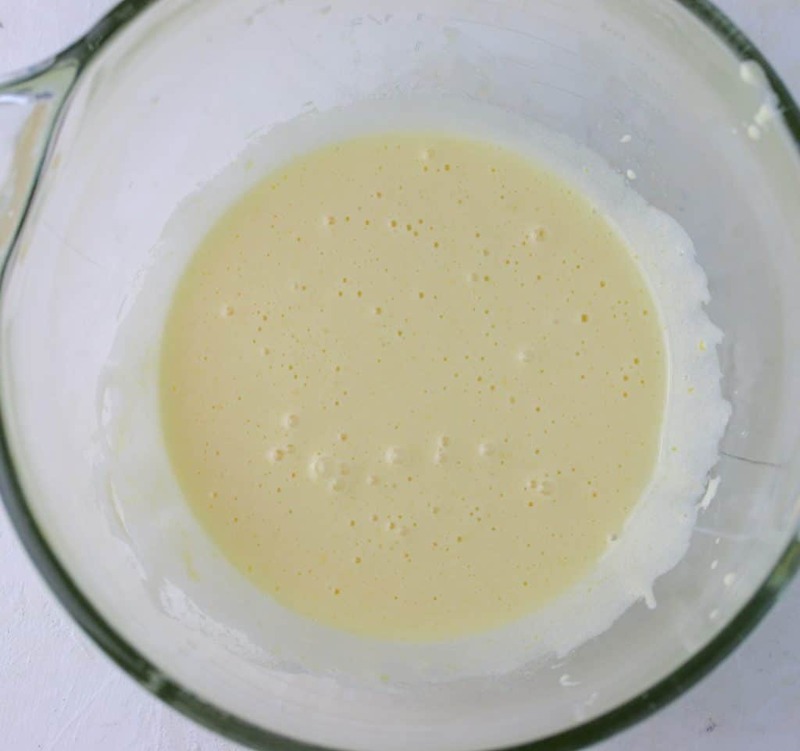 In a stand mixer, or in a bowl with a hand mixer you are going to mix the eggs and sugar together for 5 minutes until pale and fluff. This creates a lot of air into the mixture. The mixture should be pale yellow and ribbony. First you want to use a neutral tasting oil. I used vegetable oil but canola oil works as well. You want to stream this in with the mixer running on low. Take your time doing this so you don’t deflate all the air you just whipped into the mixture. Then add in the bananas, vanilla extract, and sour cream. Now using a spatula, fold in the dry ingredients. Just don’t overmix! 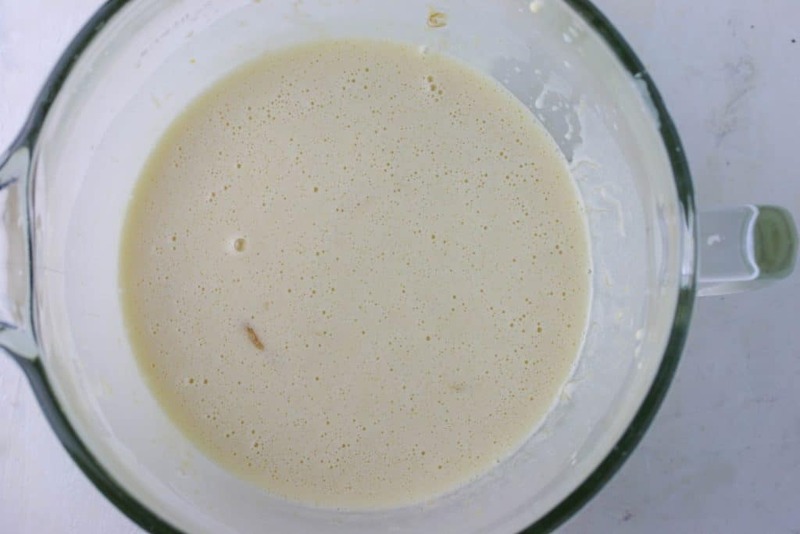 Overmixing will cause the gluten in the flour to form and too much gluten creates a tough bread. 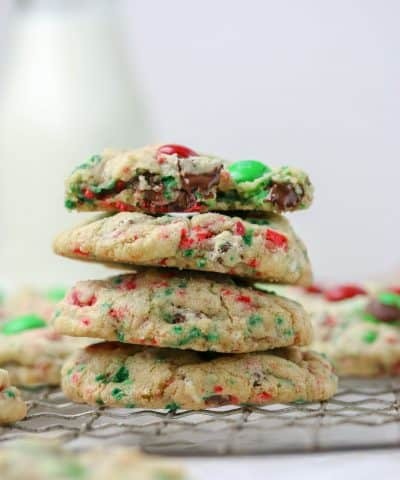 So stop mixing once the last streak of flour is incorporated. 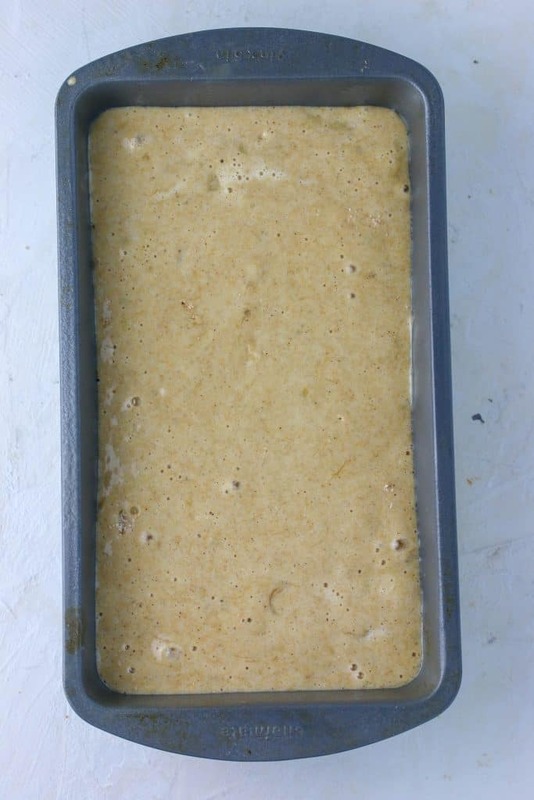 Then you want to pour the batter into your greased 9×5 inch loaf pan and bake! Bake on a middle rack in a pre-heated oven. And bake for 60-70 minutes until a toothpick comes out clean. The key to making moist banana bread is using very ripe bananas. The blacker the better when it comes to the bananas! Not just flecks but really black. You also want to make sure that you don’t overmix! You want to make sure you use very ripe bananas. Bananas that have lots of black specks. The blacker the banana is the sweeter it will be. I actually like to freeze my bananas when they have gotten too ripe to use later for banana bread. If you use frozen bananas, then let the bananas thaw before using them. 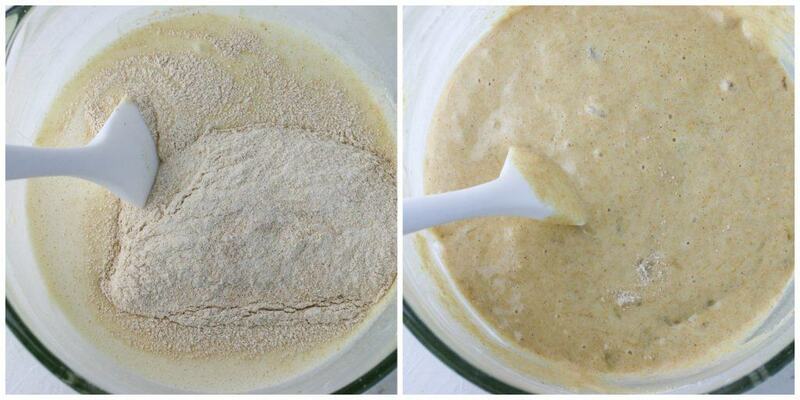 Mash your bananas before adding them to the mixing bowl. I do this by hand with a fork since I have used frozen bananas they are very easily mashed. 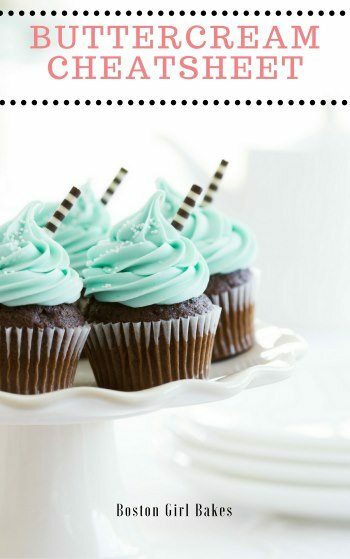 You could also use a pastry blender, potato masher, or a hand mixer. When you add the oil into your the sugar and eggs you want to S-L-O-W-L-Y add it in with your mixer on low. This step should take about a minute. So slow. If you add the oil in all at once you risk of deflating all that air you incorporated into the eggs and sugar in the step before. Measure your flour accurately. I use the spoon and level method. 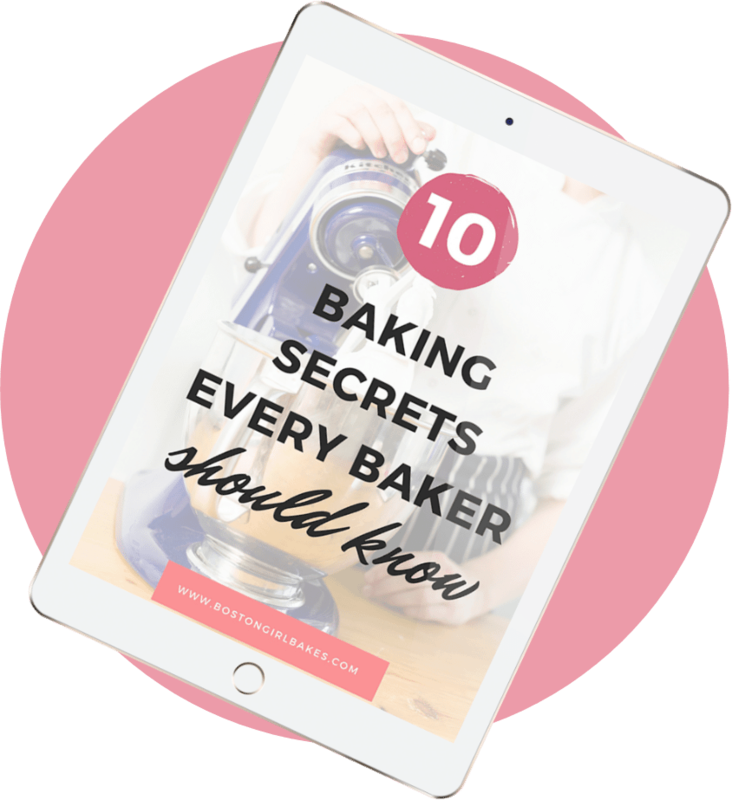 You can learn how to measure your flour in this post. Careful to not over mix. I like to use a spatula and fold in the dry ingredients by hand. You want to stop mixing once they have been incorporated. Too much mixing = too much gluten forming. Gluten is what will give a bread its chew, but for a banana bread you want less gluten to form. So we can accomplish that by making sure we don’t overmix! 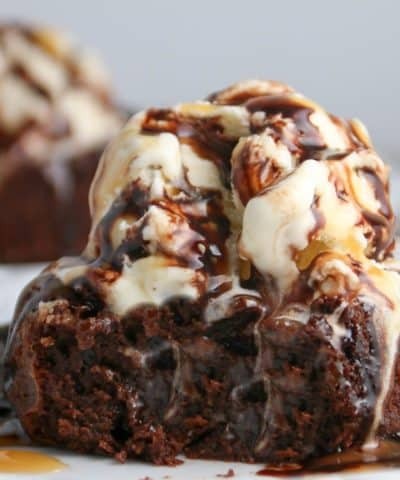 What Can You Put In A Banana Bread? I kept this recipe simple. 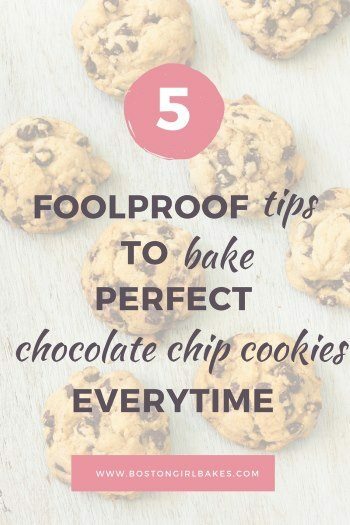 But you can definitely add in chocolate chips, dried fruit, or nuts. 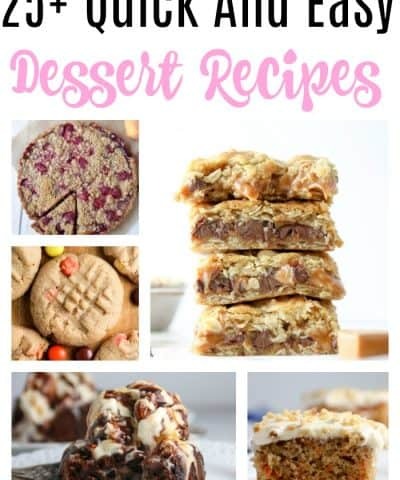 For this recipe I would recommend 2/3 cup of any of those. If you decide to in nuts, you really want to make sure to toast them before adding them to the recipe. 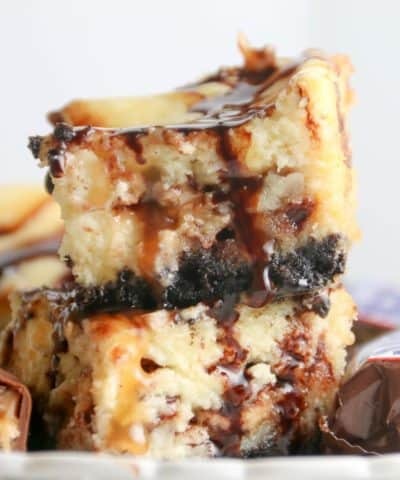 You could also try adding in peanut butter or Nutella and give it a whole new twist! Kitchen-aid mixer – you could use a hand mixer but a stand mixer will make quicker work of this bread, and save you the arm workout. Sifter– Sifting your dry ingredients is key in making this banana bread light and fluffy. 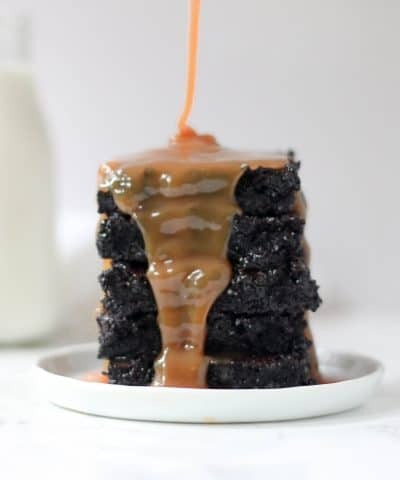 If you like this recipe, the be sure to leave me a comment and star rating below! 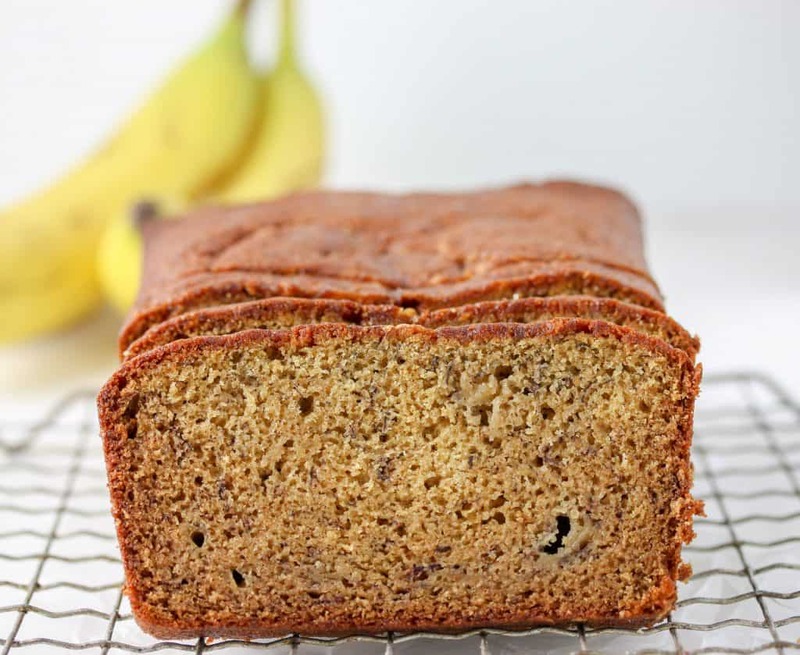 This 100% Whole Wheat Banana Bread is super moist and delicious! Careful to not over mix. 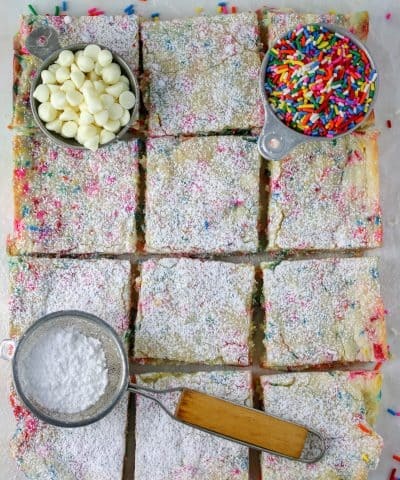 I like to use a spatula and fold in the dry ingredients by hand. You want to stop mixing once they have been incorporated. Too much mixing = too much gluten forming. Gluten is what will give a bread its chew, but for a banana bread you want less gluten to form. So we can accomplish that by making sure we don't overmix!